Blueberry Yum-Yum is a blue jelly polish with a ultra fine rainbow glitter. All nails are 4 coats with no top coat. Cherry Bomb is listed as a hot pink jelly polish with a ultra fine rainbow glitter. I used 3 coats and no top coat. Another fantastic formula, yes I will be saying this for all of them because they are all great! I love how the glitter in all of these jellies isn't overpowering, but enough to notice. They are all so shiny without a top coat, it's ridiculous! The color of Cherry Bomb is a lovely pinkish red and reminds me of strawberries. 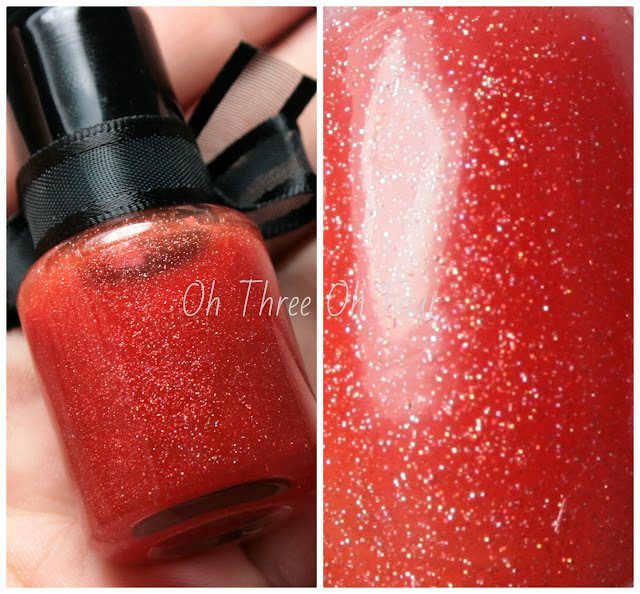 Orange You Jelly has a orange jelly base and scattered holo glitter. All nails are 3 coats with no top coat. Like I said no top coat need, they are super shiny without it! Plum Crazy is a vibrant purple jelly with a extra fine holo glitter scattered throughout. I used 3 coats with no top coat. When I first opened up my package from Lacquerhead Polishes, this was the first jelly polish I saw and I thought "This is for sure my favorite". After opening up the entire package, I couldn't decide because I really love them all! I'm just a sucker for purples no matter what. ;) I used Plum Crazy as a base color to Lacquerhead Polish's Save The Bows (post here) and you can tell with 4 coats instead of 3, it is a little darker. The great thing about these jellies are they can be used as base colors, top coats or you can build them up just to have a great color! The possibilities are endless! :P P.S. Plum Crazy had a perfect formula. Lacquerhead Polish can be found on etsy here. She now offers cuticle oils, that currently ship free with other products. I'm off to buy one and a bottle of You're The Fruit In My Nutcake. ;) Also, make sure to like Lacquerhead Polish on Facebook here!